Wrestler Sushil Kumar today created history by becoming the first Indian to win back-to-back Olympic medals but the coveted gold medal eluded him as he lost the men's freestyle 66 kg category final to his Japanese opponent rather tamely at the ExCel Arena here today. The 29-year-old Sushil found the Japanese Tatsuhiro Yonemitsu, a tough opponent as he carved out a 3-1 victory to shatter the his hopes of winning a gold medal. 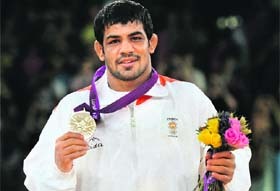 Sushil Kumar with the silver medal in 66kg wrestling. He is the first Indian to win two individual Olympic medals. Yoga guru Baba Ramdev on Sunday warned of a �big revolution� if the government did not meet his demands for announcing immediate steps to bring back black money, enactment of a strong Lokpal and measures to end corruption. As his fast entered the fourth day, Ramdev said a fresh letter has been written to Prime Minister Manmohan Singh, urging him to take cognisance of his demands. Former Army Chief VK Singh and Ramdev in New Delhi. Pakistan has objected to India�s move to fill the Nimoo-Bazgo dam in Jammu and Kashmir, claiming that it could cut off Islamabad�s share of water from the Indus. India had informed the Pakistan Government that the dam had been completed and was going to be filled. �We have asked India not to fill the dam as it is a disputed and controversial project,� an unnamed senior official of the Ministry of Water and Power was quoted as saying by The Express Tribune. As the monsoon 2012 saga feebly unfolds over the Indian mainland, a Pacific Ocean condition christened El Nino is emerging as one of the main reasons for the deficiency. El Nino, which literally means boy in Spanish, has been held responsible for spoiling the latter part of India�s June-September rainy season by the he weather office. The Tribune spoke to well-known meteorologists � IMD Director General LS Rathore, India�s permanent representative at the WMO Ajit Tyagi and IMD Director SC Bhan � to understand what makes El Nino pivotal to the Indian monsoon story.